Seattle, WA / July 22, 2014 / With the increase of cyber attacks, identity theft and other attacks related to internet use, users are called upon to arm themselves with tools which will protect their information as well as their devices. With most of the anti virus in the market offering partial protection, Spyhunter is one of the tools which have been identified as very effective in offering full protection. According to its developers, the antivirus is a real-time anti -spyware application certified by West Coast Labs' Checkmark Certification System. The software is designed to help the average computer user protect their device from threats. While most of the anti spyware applications in the market are offered at exorbitant prices, Spyhunter is available for free. All that the user needs to do is to download it in their device and get the full protection. Also when it comes to configurations, the users only need to install it and get immediate and ongoing protection. Malware and other threats continue to evolve and becoming more sophisticated, making it hard to detect by the antivirus or spyware programs in our personal computers. This calls for advanced technology which will ensure that no threat goes undetected and neutralized.Spyhunter is designed along this line, "we stay several steps ahead of today's malware threats, we have programmed our product in such a way that no threat will go undetected and necessary action taken to avoid infecting your files or compromising your PC, " said the one of the Spyhunter developers when explaining what this anti spyware presents to the users. One of the features that cut this antivirus program apart from the rest is the fact that it comes with extra customization capabilities to ensure that every users is able to fit his or her specific needs in the course of its usage. Malware protection where it will detect, remove and block all the threats. The software also comes with a compact OS which has the capacity to remove rootkits as well as other stubborn malware infections. Its system guards will identify and stop any process which attempt to auto start malware entries through exploiting the windows registry. There are issues which SpyHunter may not be in a position to solve; a reliable one on one support is available to handle all the issues which may arise in the course of using the program. SpyHunter reviews show that this is one of the best anti virus in the market; most of the reviewers have cited its user friendliness as well as the effectiveness in offering full protection to a personal computer. 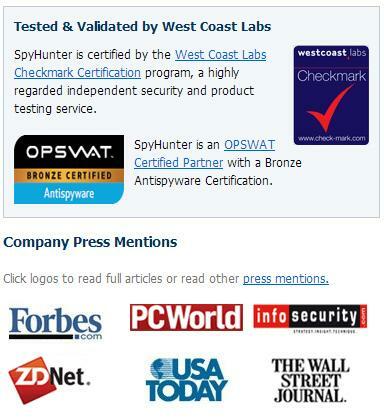 SpyHunter Download has also been cited as one of the experiences that most users enjoy. It does not take time to download and the memory space which is required is minimal.